Zach Mettenberger dropped to 0-7 as a starter with Sunday's loss to the Falcons. After making his first start of the season in Tennessee’s 10-7 loss to the Atlanta Falcons, Titans quarterback Zach Mettenberger lamented the mistakes that led to his team’s fifth straight loss. 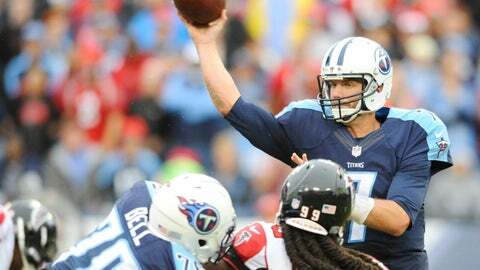 Mettenberger, starting in place of the injured Marcus Mariota, completed 22-of-35 passes for 187 and a touchdown. However, he also threw a pair of interceptions, the second of which came with 1:31 remaining, ending the Titans’ hopes of tying or taking the lead. “It was a poor decision by me,’’ Mettenberger said, per the team’s official website. “I should have hit (tight end) Delanie (Walker) underneath. In that situation all we needed was to get 12 yards and get in field goal range to push it into overtime. It was just a bone-headed mistake by me to not fully grasp the situation." A six-round pick in 2014, Mettenberger dropped to 0-7 as a starter. With Mariota’s status uncertain for next Sunday’s game against the Houston Texans due to a sprained MCL suffered last week against the Miami Dolphins, Mettenberger said he hopes to turn in a more complete performance if given another chance to start. “If I get the opportunity again hopefully I can make the most of it and play better,” Mettenberger said.